Earlier topic: Is it safe to add shimmer to a colour? i was thinking in purchase a kelsey excelsior 3x5. I need your oppinion about the price i should to pay and the condition of the pieces of this. I know how much you want to get into letterpress and I welcome you to this wonderful craft! I, personally would think it best if you could buy a small press no smaller than 5x8. A 3x5 press is much too limited because of size. Also suggest you try to get a press that is complete with new rollers etc. Best of luck to you! Sal…. it all depends upon what Franciso wants to print. If the intent is to print business cards or envelops or small book plates in limited quantities, then the 3x5 is a great little machine. I’ve got one permanently set up with my shipping labels… and it works fine for that application. It IS quite small for anything like postcards or text, though. For a Kelsey, I would not be too concerned about rollers. NA Graph has 3x5 rollers available for immediate shipment. 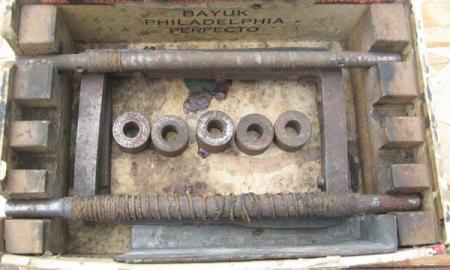 With a used press, you typically want to get new rollers anyway. As far as price goes, it’s hard to determine. Recently, I’ve seen them go for as little as $65 and as much as $250. It all depends on location. I have one like it on offer right now for $150 plus shipping. I haven’t calculated shipping but I suspect it would be less than the $60 estimated by this seller. If the buyer who asked about it decides against it, it will be available. 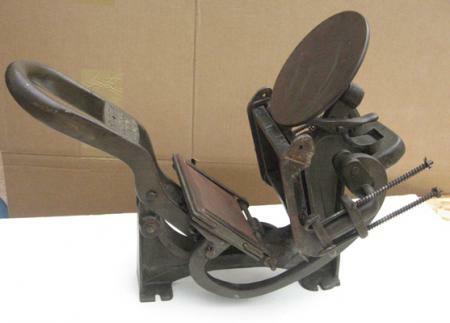 Look on Briar press for “Apartment-Dweller’s Print Shop” for more info. AdLibPress..How do you plan to ship it? I couldn’t get shipping on a 5x8 Kelsey below $150. Although that included a wood crate. Is there another way? Maybe we’re not talking about the same thing. The original poster had inquired about a 3x5 Kelsey (it was posted on Ebay). My press is a 3x5 not a 5x8. I had offered it with an “Apartment-Dweller’s Print Shop” on Briar Press for $400 total. I offered only the press to another inquirer for $150 plus shipping. I checked UPS’s website and for a parcel the size and weight of the “Apartment-Dweller’s Print Shop” they said the cost to ship to Minnesota would be $111. That would include the press. Shipping cost also depends on where it’s going. I know a 3x5 is too limited, but i couldn’t find anything better on the internet. 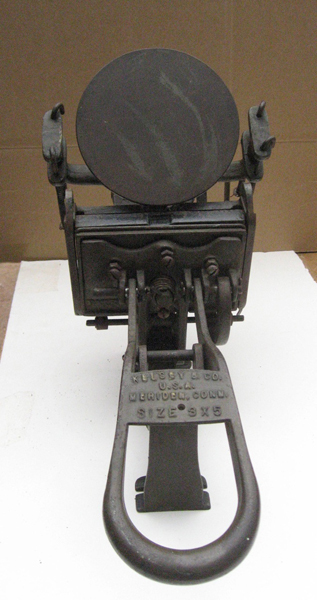 I’m from Spain and this type of press is unusual, i found a lot of Albert Frankental presses, Minervas, Boston, Heidelberg… But this are huge and expensive presses. I don’t know what to do, but thanks to all. I have a Kelsey 3x5 and in my opinion it is a good press to have, to learn on, and to print small items (or small areas of large items). It is a nice press to do a quick print run and requires very little cleanup. You do not need to spend too much money on parts, and when you are done printing it will fit nicely in a cupboard or on a shelf. You will need very little ink or cleaning solvent. 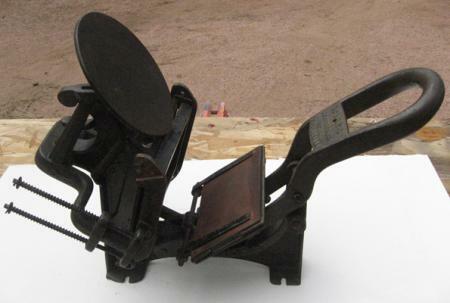 If you are located in Europe, I would suggest to also look into Adana presses (as suggested in a previous post). Presses, parts, and instruction are more widely available for Adana in Europe. 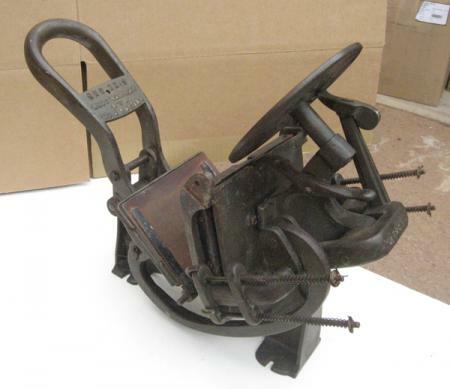 The press you have shown looks complete. It will need some rust removal and lubrication. In the U.S., I think it would sell for between $75 to $200. Also look into how much rollers cost, and if you want to print with type, dies, or polymer plates. Thanks, I found some Adanas in the UK. Now I’m trying to get one. You know, I’m new on this, I have no idea in a lot of things. I’m a graphic designer, I know what type it’s, but, what it’s the diference between print with dies and with polymer plates?